Your baby will be cozy and warm with the Doudou the Rabbit theme. A complete solution comprising a comforter, bed skirt and sheet. Stylish and multifunctional, this crib transforms into a toddler's bed as your baby grows. This crib and toddler's bed from our Angel collection is a winning combination for your little one's room! No need to spend money on another bed when your baby is older you can convert this transition piece from crib to toddler's bed. The ultra-firm, comfortable vinyl mattress is included. 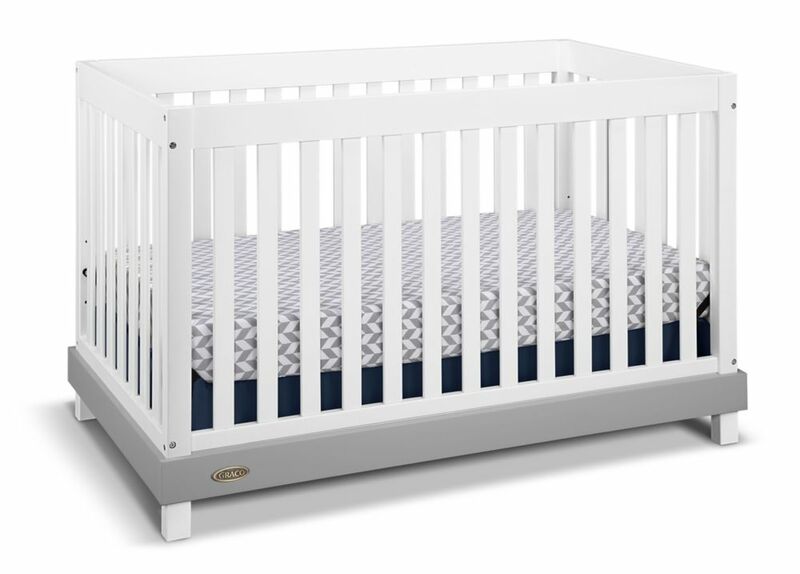 Maddox Convert Crib-White/Grey With a simple modern design and beauitiful two-tone finish, The Graco Maddox 4-in-1 Crib is the perfect choice for any nursery. The Maddox is a low profile crib that provides easy access to your baby while adding style to your baby's room. The Graco Maddox Crib is versatile and will grow with your child as it transitions into a toddler bed, a daybed and a full-size bed providing your child with years of enjoyment.The Graco Maddox crib is JPMA certified and is compliant with all CPSC and ASTM safety standards to ensure the safest sleeping environment for your child.